Motion detection will trigger alerts only when there is movement in front of a camera. WebCam Monitor includes high-performance motion detection algorithm based on image comparison. Motion detection process involves computing the difference between pixels of two images. If difference between the compared pixels of images crosses a threshold value then motion is detected and alerts are triggered. It allows you to save large amount of hard disk space. To configure motion settings, click on Add Webcam >> Actions >> Motion Settings. Current motion level in camera is shown in Motion bar. In Preview control, you can see the live image from your camera and adjust Motion Trigger level using slider. When the blue bar crosses the slider control then it will turn red and alerts will be triggered. WebCam Monitor helps you quickly identify the location in the video where motion is occurring. When Highlight motion movements in color option is selected, the moving object will be highlighted in specified color in Video Recordings and Photos. You can highlight motion in 3 different colors i.e. Green, Blue and Red. Use Highlight camera border in red to easily distinguish which camera has motion detected. WebCam Monitor may raise false motion detection alarms because of PTZ movements. You can avoid such false alarms by Suppress the motion detection during PTZ. 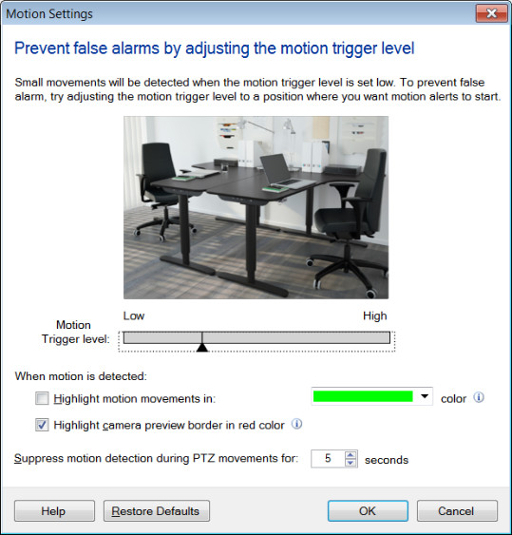 You can specify how long motion detection should be suppressed immediately after PTZ movements. It is inherent with any machine based operation, motion detection is not 100% accurate. It may ignore genuine motion at times or report motion when there is none leading to false alarms. As motion trigger level decreases, WebCam Monitor detects the slightest motion, and as motion trigger level increases, it detects only pronounced motion and ignores slight movements. You might think that setting motion trigger level low is better, but low value for motion trigger level can cause false alarms. To improve motion detection accuracy, it is important to select an optimum (as high as possible) motion trigger level value while keeping the chance of false alarms to a minimum.